Follow the steps described below to create a new set of posting periods for a year. This process is normally a part of preparing for the beginning of a new year at or near the end of the year. Follow the menu path Administration > System Initialization > General Settings. When the General settings window appears, click on the Posting Periods tab. Click on the “New Period” button. Enter the desired date ranges normally the beginning of the year to the end of the year, as shown. The result should be the creation of 12 new posting periods for the coming year. These can be viewed in the previous window which should be re-displayed. 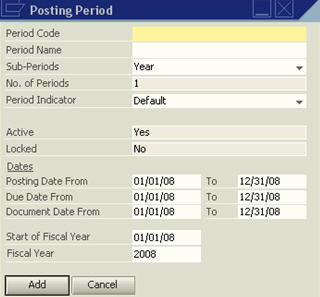 These newly built values for the posting periods can be viewed and adjusted as desired by clicking on the drill into arrow just to the left of the posting period code.